I’m sure most of us can commiserate – no matter what we’ve accomplished in the past year, our industry changes so fast that it’s hard not to feel like there’s something we missed or could have done better. The good news is that there’s always time to up your game when it comes to content marketing, and we have a stable of experts who provided need-to-know tips, tactics, and techniques for doing just that. If you’re ready to start the new year feeling prepared to tackle any content marketing challenges that come your way, read on for some killer ideas that will help you reach your goals. Many of the most successful content marketers seem to have one key thing in common: They developed a content marketing strategy to guide their ongoing efforts. As we’ve seen in our annual research over the last few years, those with a documented content marketing strategy feel significantly less challenged with every aspect of content marketing. Whether you are starting from scratch or want to tweak your strategy to optimize your results, these resources will help you cover all your bases. 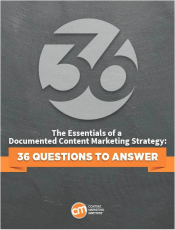 For more guidance on content marketing strategies, download our 16-page guide, The Essentials of a Content Marketing Strategy. For more on teams and processes, check out our eBook, The State of Content Marketing Operations for the Enterprise. Content creation is where the fun part begins, but it can often be the most intimidating step in the content marketing life cycle. The options are endless, but this makes decision-making difficult. Not to mention that consumers’ voracious appetite for valuable content can test even the most creative-minded professional’s ability to continually come up with new ideas. The following tips, tricks, and techniques should help you bust through writer’s block, maintain high-quality standards, and keep the pump primed with content in a variety of engaging formats. Is It Time to Hand Consumers the Keys to Your Content Creation? 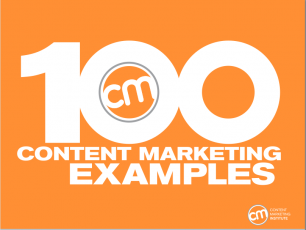 Take a page from the experts when it comes to creating elegant, engaging, and just plain cool content marketing efforts – check out CMI’s eGuide, 100 Content Marketing Examples. Content marketing has reached a point in its digital evolution where words alone are no longer enough to keep customers and prospects engaged and loyal. In 2014, image-centric content formats and platforms reigned supreme. Newer visual marketing platforms like Vine, Instagram, and Snapchat were granted true marketing legitimacy, while the old standbys of infographics and videos were challenged by the need to keep innovation and inspiration alive. For additional perspectives on visual storytelling, check out our Twitter chat with Buddy Scalera. To language-minded content professionals, looking at numbers can sometimes feel like being lost in a foreign country – you don’t know the language and aren’t quite sure how to get to your destination. 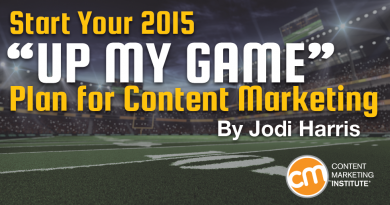 But content marketing measurement doesn’t have to be intimidating. The following posts provide some guidance that will help you navigate the most critical metrics for your particular needs. Still need some help getting your analytics skills to measure up? 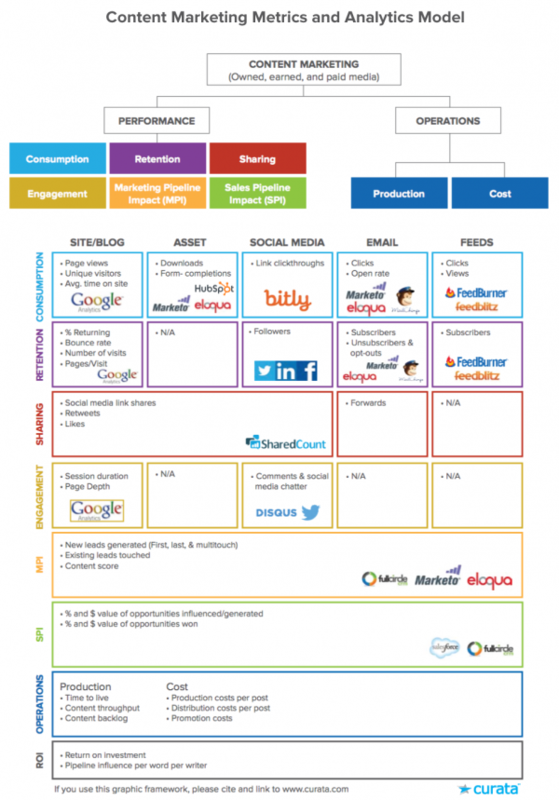 Check out this handy chart created by Pawan Deshpande at Curata. If you want your content to be successful, you need to do everything you can to make sure it gets in front of the right audience at the right time. Whether you want to build a strong network of subscribers, syndication outlets, and paid spots, or just rely on the kindness of influential strangers in your target industry, the following tips should help you skillfully spread your message to the masses. Now, I’d love to hear from you: What are your favorite lessons from 2014 that you’ll be taking into 2015? Want to be even more prepared for content marketing challenges in 2015? Sign up for the Content Marketing Institute Online Training and Certification program. Access over 35 courses, taught by experts from Google, Mashable, SAP, and more.